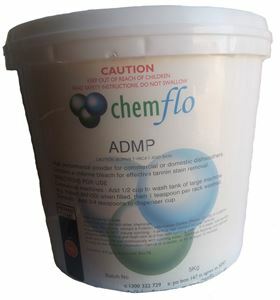 ADMP contains a high level of phosphate. These soften the water, and so prevent scale formation in the dishwasher. Chemflo Bright (oxybleach) is a complete product containing enzymes and detergents which help with general cleaning as well as removing bleachable stains.